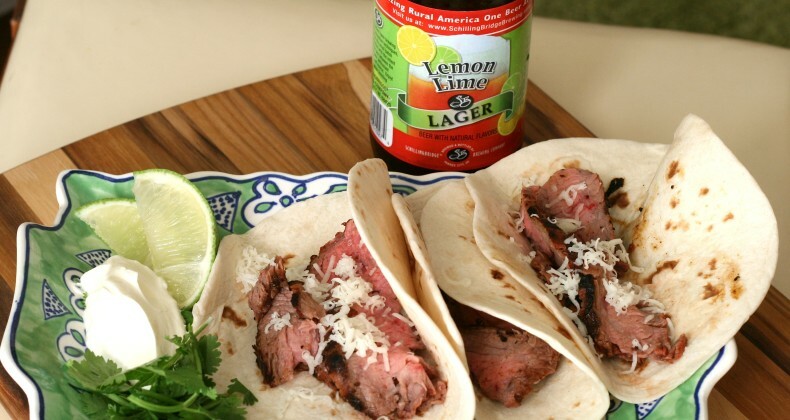 Chipotle Lime Steak Tacos are a perfect summer dinner. No need to heat up the whole house when you can have steak tacos from the grill in minutes. Add this one to your summer rotation and everyone will be happy. One thing I love so much about living in such a diverse country is the accessibility to myriads of international foods and ingredients. I am not even sure what “American food” is anymore. Hamburgers? Apple pie? Deep fat fried everything? I have enjoyed Mexican (inspired) food since in utero. We have taco night at our house several times a month. When we were in Colorado we ate at LuLu’s BBQ in Louisville. The special that night was smoked brisket tacos. Having never had barbecued tacos before I ordered them. They were wonderful! It was the inspiration for this dish. The marinade used is made from scratch. As I was walking through the grocery store I saw a bottle of chipotle lime marinade, I picked it up and quickly discovered I couldn’t pronounce half of the ingredient list. I knew I would just use the ingredients I could pronounce in my marinade. Pick a good cut of meat to marinate. I used flank steak which I grilled then cut thinly across the grain. The result was spicy, smokey, tender steak tacos. You are not kidding about enjoying Mexican(ish) food in utero! Mexican, Italian, Snickers candy bars & Dr Pepper…..this is what you grew on! Bland food made me puke! It’s a wonder you are as brilliant as you are! Love you & see you soon, Mom. What a great post, especially because I am craving tacos like a mad woman right now. I need them real bad in my life right now! I love “lime” tacos, so you are making me happy with this recipe!